Sathya Narayana Raju (later Sathya Sai Baba) is reported by several devotee writers as having said he will die at the age 95 and/or 96 (in some places in India a person who is 95, yet is in-the 96th year, is said to be 96 years old.) 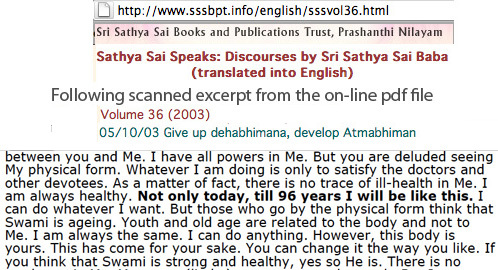 On various occasions Baba has reportedly said in private that his life would last 96 years [eg by S. Balu, ‘Living Divinity’ London: Sawbridge Enterprises, 1981, p. 29] which age he finally confirmed in a discourse in 2000. Yet, contradictorily, in two early discourses in 1960 and 1961 respectively, he gave the length of his remaining life as 58 and 59 years (see scan of one instance below). This adds up to a life-span of only either 92 (or 93 years if one reckons SB is at 58, in his 59th year, as commonly done in India). However, Mr. Ratan Lal, who was one of the closest associates of Sathya Sai Baba for many years, reported in a lecture at the ashram that Sai Baba had repeated the prediction of 96 years personally to him, telling this to a friend of ours who edited his books for him (Anne-Irene). Sai Baba later confirmed he would die at 96 in a public discourse. Moreover, Sai Baba had also told Ratan Lal that was no-one’s business when he would leave the body – he could even prolong his life if he deemed necessary! It certainly seems he was covering himself for whenever it actually happens. Mr. and Mrs. Ratan Lal lived in the Prashanthi Nilayam ashram as very close servitors to Sathya Sai Baba for decades. They knew a great deal about what went on and partook in the cover-up of the sexual abuse facts and all untoward incidents, as all residents must do, or lose their apartments and, in many cases, face destitution (as did the long-devoted resident families of some of the four students who were executed in 1993). Read more about the Ratan Lals here. This entry was posted on May 11, 2008 at 5:25 pm	and is filed under Faith, Gurus. 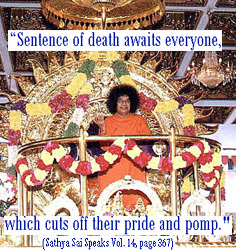 Tagged: death of Sai Baba, Sathya Sai Baba. You can follow any responses to this entry through the RSS 2.0 feed. You can skip to the end and leave a response. Pinging is currently not allowed.